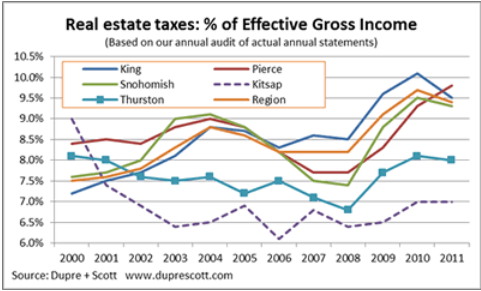 Are you reviewing the property tax assessments on your apartment building investments every year? In Seattle apartment research providers Dupre+Scott found that “this year almost 20% of the sales were assessed for more than they sold for. They were over-assessed by an average of 22%”. In their video narrated by the xtranormal sounding ‘Kate Gardens’ she says: “With apartment prices climbing so much in the past year, we didn’t think many properties would be assessed for more than they sell for”. But their research shows that’s not entirely the case. “… between 2000 and 2008 the average apartment was assessed for only 70 to 80% of what it sold for. Then things changed. In 2009 and 2010, the average property sold for less than its assessed value. And even though assessed values make more sense today, compared to prices, they are still higher than they used to be”. How often are values reassessed? Is there an automatic reassessment triggered by a transaction? What is the exact millage rate? How are they set? How often do they change? Are there limitations to the increases in assessed values during the hold period (a la Prop 13 in California)? What is the timing of the assessments and when exactly are bills due? What is the appeal process and how long does it typically last?